Cauliflower doesn’t have a ton of flavor on its own. When I’ve made it in the past, I’ve either roasted it on a baking sheet or steamed it because I rarely feel inspired to do much more with it. Last week, Curtis Stone posted a recipe for cauliflower gratin, which only required five ingredients, so I thought I’d try it. It’s basically just cauliflower and cheese — the cheese sauce is a roux with grated Gruyère thrown in. What I most liked about this recipe was that the cauliflower still had texture and flavor — it wasn’t overpowered by the sauce, though it made a lot of sauce for just one head of cauliflower. I could have easily added another half of a head of cauliflower and still had an abundance of sauce. But, this is another nice, simple way to do something more interesting with cauliflower. While the water is heating up, break up the cauliflower into medium to small florets. Cook the cauliflower for 3 to 4 minutes, or until just barely tender but still has a bit of bite. Transfer the cauliflower to a bowl of ice water and cool completely. Remove the cauliflower from the ice water and allow to dry completely. Heat a medium heavy saucepan over medium heat. Add the butter and stir until melted. Whisk in the flour to blend well. Cook, whisking constantly, for about 5 minutes, making sure the mixture doesn’t take on any color. Slowly whisk in the milk and bring the mixture to a simmer. Simmer for about 10 minutes, or until the flour taste is gone, stirring often and making sure the sauce does not stick to the bottom of the pan. Gradually add 1 1/2 cups of the cheese, whisking until melted and smooth. If the sauce thickens too much, thin it out with a little more milk. Season the sauce to taste with salt and pepper. 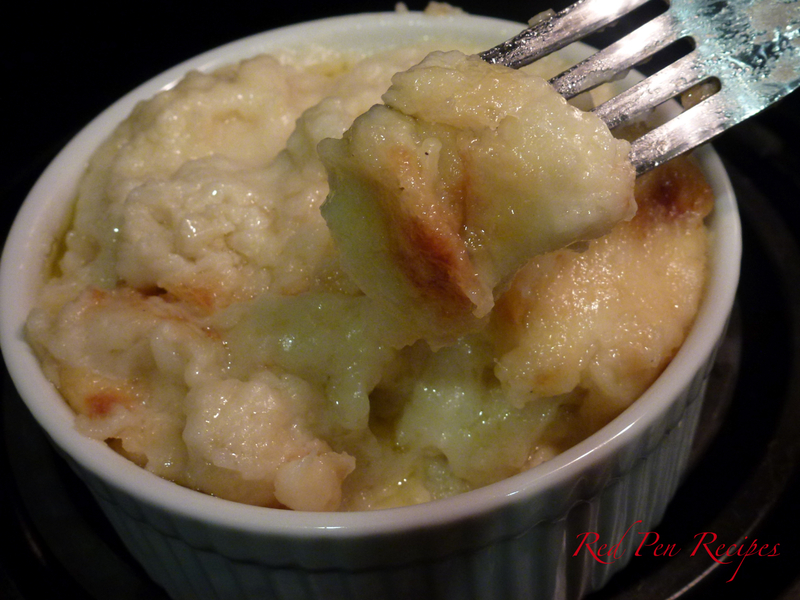 Place the cauliflower in an ovenproof dish and drizzle the sauce evenly over the cauliflower. Sprinkle the remaining cheese over the top of the cauliflower and bake for about 10 minutes, or until the top is light golden brown. Let stand at room temperature for about 5 minutes before serving. This is one of those recipes you really dig your hands into. It’s a basic biscuit recipe with a couple extra ingredients added for flavor and flair. I got the idea to make these after visiting a coffee shop a couple weeks ago. They had ham-and-cheddar biscuits on the menu, so I ordered one and was surprised at how much I liked it. Since biscuits are a pretty easy thing to make, I set out to find a recipe and found this one. If you don’t have buttermilk, you can use the old trick of taking a one-cup measuring cup, adding a tablespoon of lemon juice, filling it up the rest of the way with milk, and letting it sit for about 5 minutes. These can be made quickly, whether you want to eat them for breakfast or pair them with a salad for dinner. I’ll be in Boston next weekend, so look for my next post in two weeks! Stir flour, baking powder, sugar, and salt in large bowl to combine. Add cold butter cubes and use fingers to press butter into the flour (see note) until the butter pieces are the size of large peas. 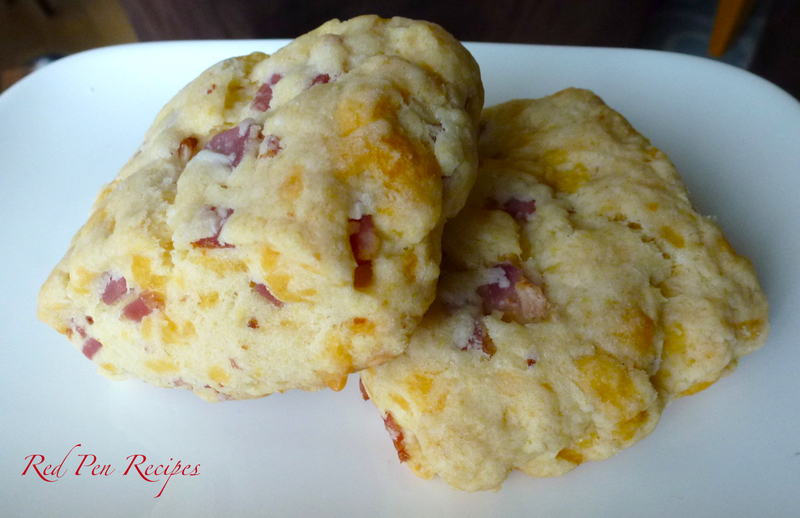 Stir in buttermilk, ham, and cheddar until just combined, using hands to press dough together if necessary. Stir in a small amount of extra buttermilk if mixture is too dry. Turn dough out onto a floured work surface and roll into a rectangle 1/2-inch thick. Fold 1/3 of the dough toward the middle. Fold the other 1/3 piece of dough toward the middle (you should have three layers of dough). Roll out to about 1-inch thick. Cut out biscuits with 2 1/4-inch biscuit cutter or top of a glass (you should get approximately 9 biscuits). Chill biscuits while you preheat the oven. Arrange biscuits on parchment lined baking sheet and bake until golden and set, 20 to 25 minutes. Transfer to wire rack to cool. I learned how to make spanakopita a few weeks ago. 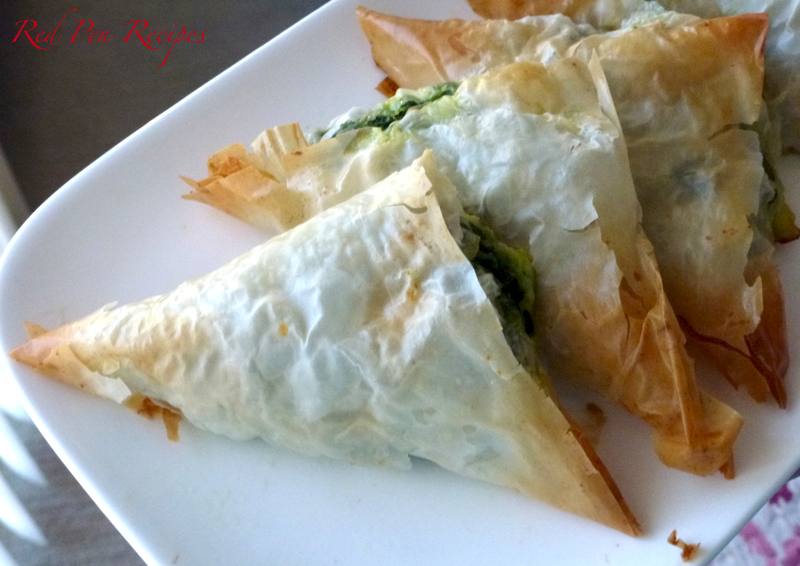 For those of you who don’t know what it is, it’s a Greek recipe in which a spinach mixture is folded into phyllo dough and baked into a crispy little triangle of deliciousness. My mom and I both like the frozen spanakopita from Costco but, as with most of the foods I purchase and enjoy, I wanted to learn to make it at home. So I did. 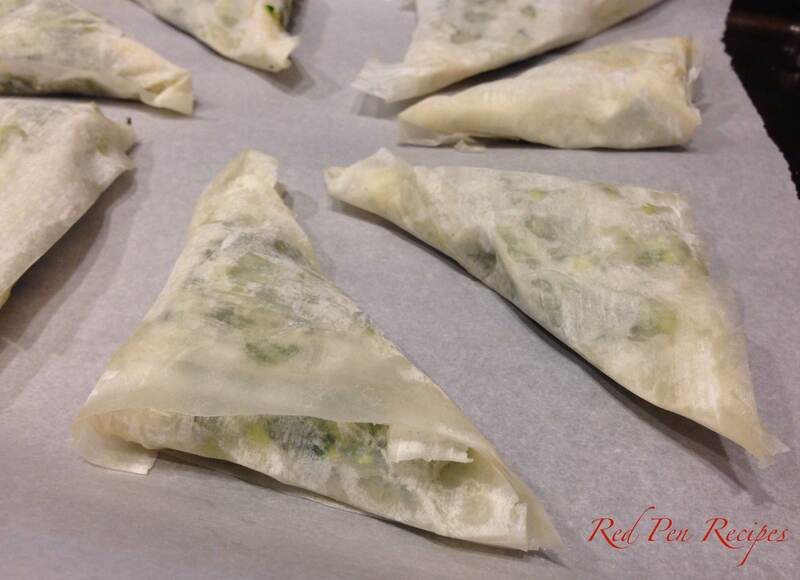 This recipe makes about 10 large triangles but, if you’re planning to serve this as an appetizer, I’d recommend cutting the phyllo into quarters. You’ll need a pastry brush and a bit of patience, but the great thing is that you can add whatever you want to the mix, so long as it doesn’t get too watery and make the phyllo soggy during baking. The dough was tougher than I expected it to be — not to say mine didn’t rip at all in the process — but, because it’s folded so many times, you can easily cover up any tears. I also used fresh spinach on my first attempt, and it required more work, because I had to sauté it to get rid of all the moisture. Next time, I will definitely use frozen spinach to prevent extra steps. I was happy that this was simple to do at home. It is a nice recipe to have in the mix for when I need to bring an appetizer to a party. In a large bowl, combine spinach, feta, parmesan, dill, basil, lemon juice, and nutmeg. Add egg, and salt and pepper to taste. 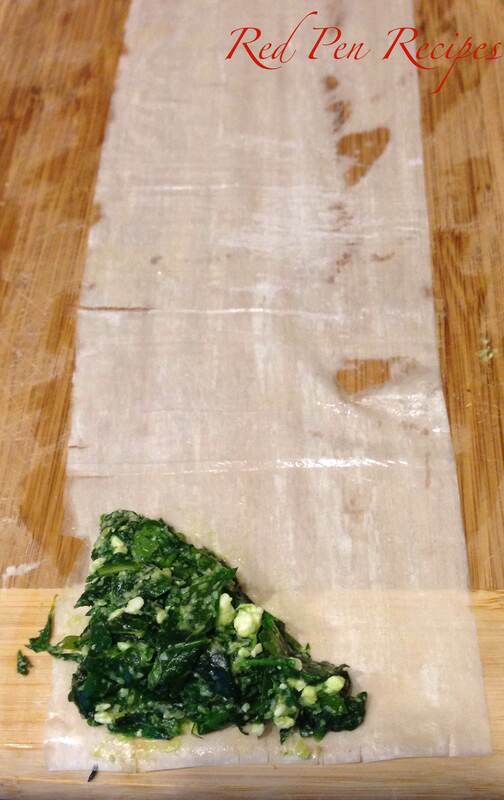 Stack the phyllo dough next to a wooden cutting board situated with the shorter end facing you. Place one strip of phyllo on the board and brush the dough with the clarified butter so the entire strip, especially the edges, are moistened. Then, take up to two tablespoons of the spinach mixture and shape it into a triangle in one of the bottom corners of the dough. Then, fold the dough, starting with the long side of the triangle. continue to fold until the entire strip of dough is folded around the mixture. Place on a baking sheet. Repeat process with remaining mixture and dough. Bake for 10-15 minutes, or until golden brown and crispy. Serve hot. Try, try again — and then keep trying until you finally figure it out. 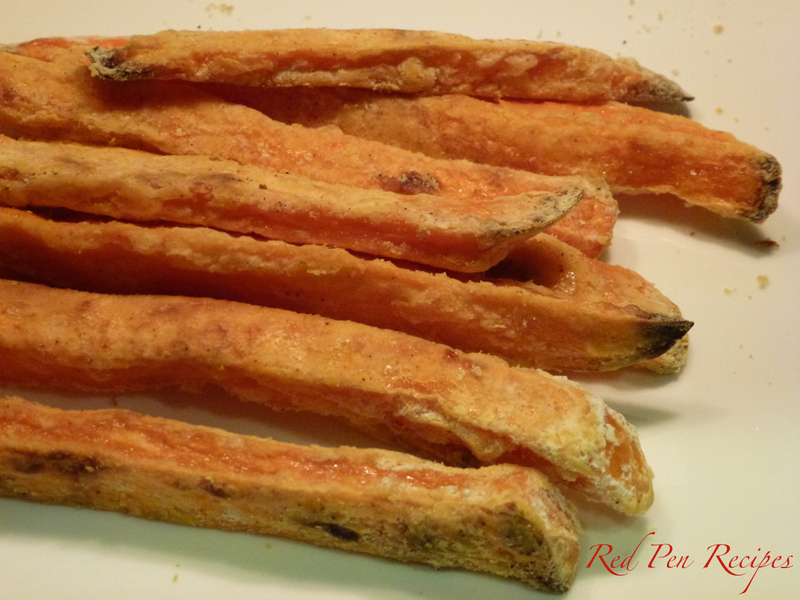 That’s what I did with this recipe for sweet potato fries. Over the past few months I tried making sweet potato fries that were somewhat soft on the inside and a bit crisp on the outside. My first couple attempts were failures due to too much oil that left the fries soggy. When I reduced the amount of oil, the fries still didn’t get crisp, so I started lining the baking sheet with parchment paper. That helped a great deal, but there was still too much oil. I needed something to soak it up. I read someone else’s recipe for sweet potato fries, and they said they added cornstarch, so I did the same. The fries were almost there, they just needed more seasoning. I’m glad to say that, on about my seventh attempt, I got a recipe I can use again for sweet potato fries. This recipe makes a single serving, but can easily be multiplied to make as much as you want. Enjoy. Preheat oven to 425 degrees. Meanwhile, peel potato and cut into 1/4-inch strips, or as uniformly as possible so they fries cook evenly. Line a baking sheet with parchment paper. Fill a one-gallon sealable plastic bag with the arrowroot, ginger, salt and cayenne pepper. On either a cutting board, in a bowl, or in another bag, drizzle the olive oil over the cut potato. Mix until fries are evenly coated. Put the potato pieces in the bag with the dry mixture. Seal the bag and shake until fries are evenly coated. Place fries on the parchment paper in a single layer. Be sure to avoid crowing so they don’t stick together and keep from getting crisp. Bake for 15 minutes, then remove from oven, turn fries over, and bake for about 15 minutes more, or until slightly crispy. Serve hot. Growing up, the only kind of baked potato my family ate was a russet potato. I saw a lot of recipes for baked sweet potatoes on Pinterest last fall, but never tried any. Last week, I had two that I needed to use, so I decided to try baking them. When I’ve had sweet potatoes in the past, they’ve involved some sort of sweeter flavor and ginger; while baked potatoes have had sour cream and chives. I decided to find a happy medium, so I stirred a bit of powdered ginger and maple syrup into some sour cream to top these baked potatoes. They were delicious. Next time, I might add either some arugula, chives or chopped green onions for some color. But for a first attempt, I was pleased with my creation. It complemented the steak I had with it. What do you put on your baked sweet potatoes? Scrub the dirt off the outside of each sweet potato. Pat dry. Pierce each potato with a fork five times. Wrap each potato in foil. Once the oven has preheated, set potatoes on the rack and set timer for 45 minutes. After 45 minutes, check potatoes for doneness. Mine took another 30 minutes before they were done. Once potatoes are done, remove them from the oven and let cool for 5-10 minutes. Meanwhile combine sour cream, ginger, syrup and salt and stir until just combined. Using a knife, cut potato just through the skin on the length of the long side. Peel skin and toss. Cut potato halfway through with three lengthwise cuts, then make five cuts crosswise. 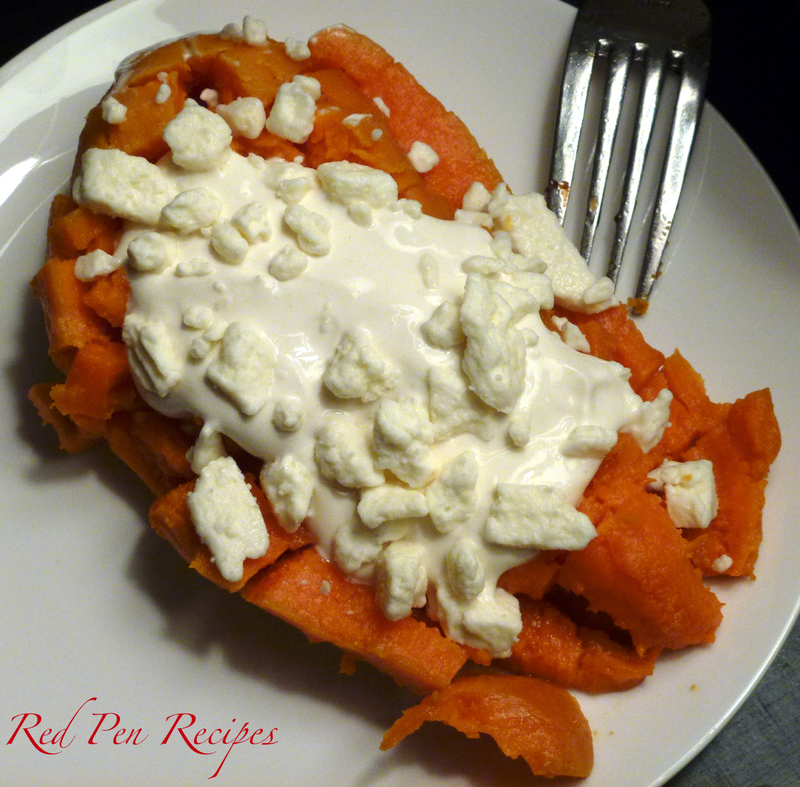 Spoon two tablespoons of the sour cream mixture and one tablespoon of feta over each potato.